The International Union for Conservation of Nature lists the Iberian lynx as critically endangered, and it considers it the most threatened species of wild cat. The animal’s geographic range once extended throughout southwest Spain and much of Portugal. But as of 2013 it occupied only 2 percent of that territory. The availability of suitable prey is key to the survival of this species in the wild. Although the Iberian lynx's coloration and general appearance resemble those of other lynx or bobcat species, this cat has evolved to specialize in its small prey. Weighing 24 to 33 pounds and reaching between 2.5 and 4.5 feet long, its smaller size enables it to easily hide to better pursue small animals, especially rabbits. This lynx’s small muzzle and teeth give its bite greater force, so it can pierce the skin of its prey and kill it more efficiently than its counterparts who attack larger species. The Iberian lynx favors the European rabbit, and this animal constitutes 80 to 100 percent of the lynx’s daily diet. This preference persists with little geographic or seasonal variation, although the cats consume ducks, partridges or young deer if rabbits are scarce. An adult lynx can subsist on one rabbit per day, although a mother with kittens will need to kill at least three. Unlike larger cats, which generally deliver a suffocating bite to the throat of their prey, the Iberian lynx delivers a single kill bite to the back of the neck, severing the animal’s spinal cord and killing it instantly. These cats are solitary hunters, and their routines are linked to those of their primary prey. They are mostly nocturnal by nature, but they're most active in the early evening when rabbits are feeding. 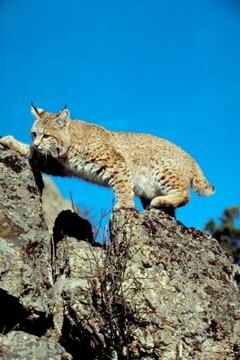 During winter, the lynx might become more active during the day to compensate for the colder climate. Habitat destruction and hunting decrease the Iberian lynx’s food sources and threaten the animal with extinction. Even where the lynx lives in parks and other protected areas, diseases such as myxomatosis and rabbit hemorrhagic disease have ravaged rabbit populations in its range, putting the cat further at risk. The Iberian lynx has been protected by law in Spain and Portugal since the 1970s, and it's also protected by international treaty.